Last year the Danish design brand Karakter Copenhagen introduced its very first collection. A carefully handpicked collection of lamps, furniture, and gallery pieces – some by designers who have already written the history of design others by those who aspire to write the future. For this years collection Karakter Copenhagen is proud to present yet another iconic designer, Achille Castiglioni. The Italian designer Achille Castiglioni (1918-2002) had a passion for re-designing, re-inventing and re-conceptualizing. Traditional interior design objects would pass through his Milan based studio and end up perfected. Comodo by Achille Castiglioni / Giancarlo Pozzi. Throughout his career Castiglioni worked to raise design to an ever-higher level of synthesis – stripping design down to the very core and eliminating everything superfluous. One of the many proofs of this approach is the Comodo from 1988. Comodo is a versatile piece of furniture designed by Castiglioni and Giancarlo Pozzi. It consists of a long metal stem (H71cm), mounted on a tripod and supporting a wood cabinet (41x30x8). The cabinet is set off-centre and has a tray-shaped lid that opens and closes with hinges. This elegant multipurpose unit can be used as a bedside table, a tray, and a coffee table or simply as a storage box for all your favorites. Supposedly Castiglioni, being a big fan of sweets, used his own Comodo to store candy. “I have always desired to do the opposite. Not because I have an anarchic behavior. But because I think the fundamental basis of design consists in thinking the opposite”. Italian designer Achille Castiglioni (1918-2002) had a passion for re-designing, re-inventing and re-conceptualizing. Traditional interior design objects would pass through his Milan based studio and end up perfected. He always aimed at enhancing and glorifying the value of the design. 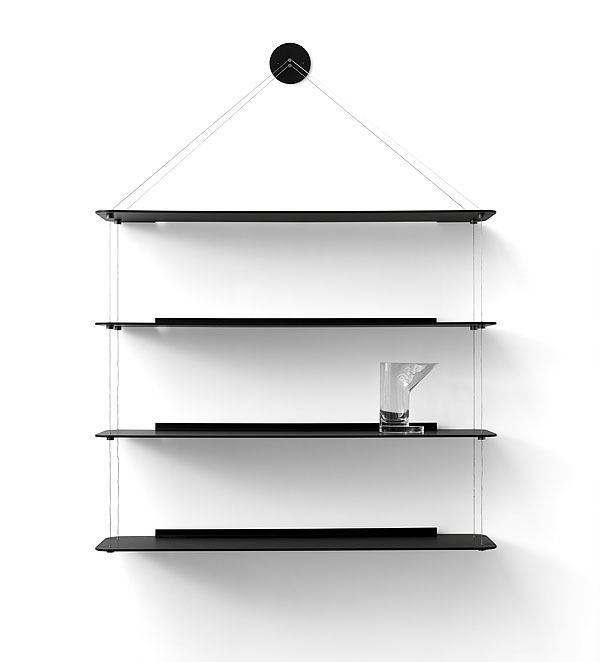 It is with great pride that Karakter Copenhagen present Castiglioni and the 2016 launch of the Wire bookcase. 50 years after it was launched it is still relevant, elegant, and very Castiglioni. Today Castiglioni’s children hold all the rights to his work and the foundation, La Fondazione Achille Castiglioni, is managed from the very same studio where Castaglioni worked for more than 30 years. Karakter Copenhagen has acquired the rights to produce several Castaglioni designs and will be launching more of his magni cent work over the coming years. Castiglioni is said to ponder a lot on lost space. Empty inches and square meters that could be lled with beautiful design – but for some reason just never were. Due to this thinking he did many designs intended specifically for the corners of the homes. Lungangolo is one of those. 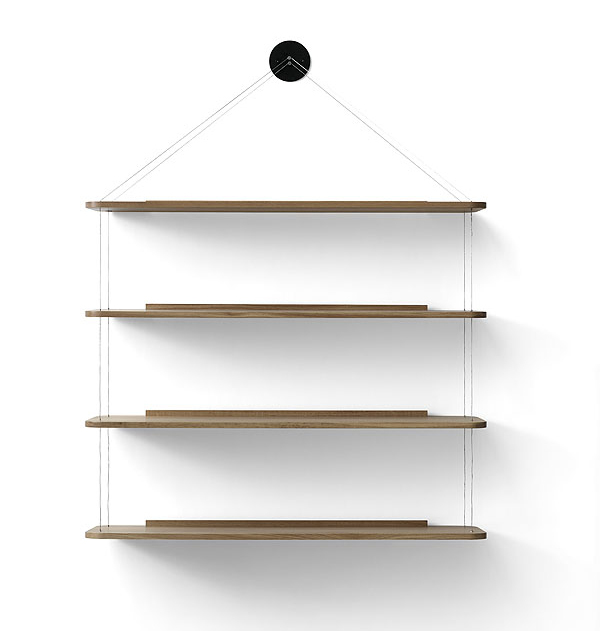 Lungangolo is a versatile set of shelves originally produced by Bernini. 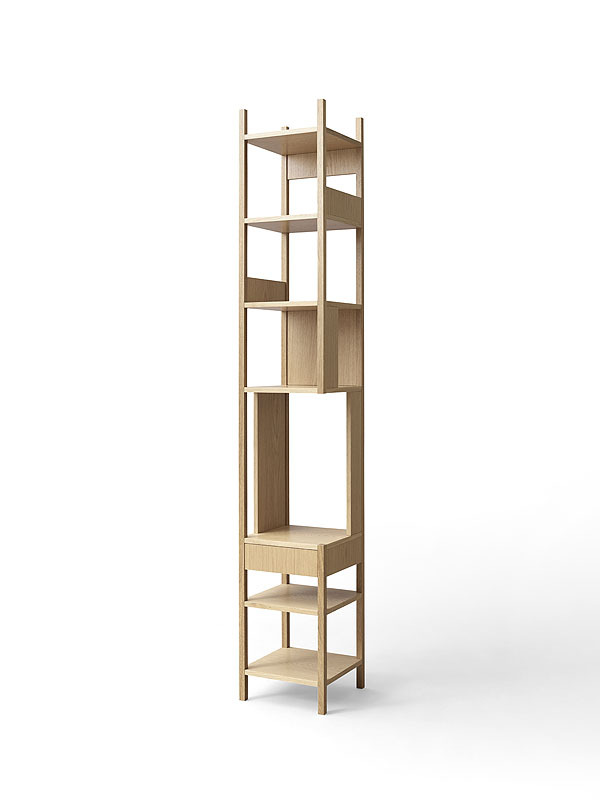 The frame is made of four slender pillars (H 225cm) with square cross-sections in between to support the square shelves (36 cm) placed in various heights. The structure is strengthened by a drawer and a side piece. 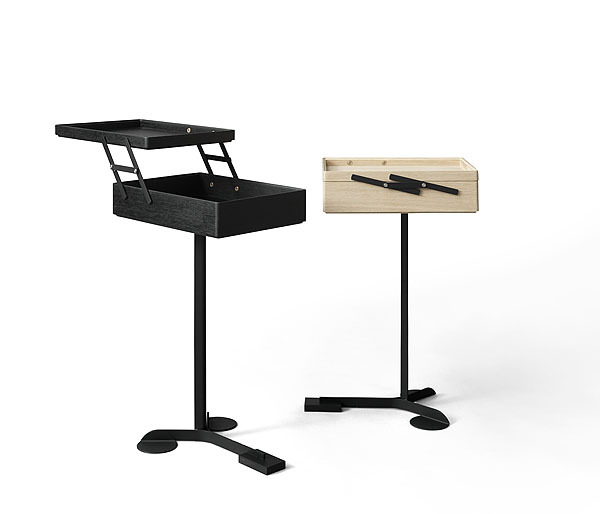 The position of the drawer and elimination of part of the support meant it had to be manufactured in two versions – to work for both left and right handed.